There are several things I need to tell you. Place of Origin is a ‘landscape as art’ project, which recently received a Saltire Award. It is located in Kemnay, Aberdeenshire, in the North East of Scotland. I need to tell you about the context. The three artists who collaborated on Place of Origin were John Maine RA, Brad Goldberg and Glen Onwin RSA. I invited Maine to lead a project which addressed the history of granite quarrying in the North East of Scotland as part of the 150th anniversary celebrations of John Fyfe Ltd. I was at that time just taking over from Fred Bushe OBE as Director of the Scottish Sculpture Workshop. I took advice from Board Members and colleagues. My aim from the outset was that the project should be artist-led. By this I mean that, where previous symposia had simply been artists sharing space and facilities but pursuing their own projects, in this case there should be an artist who led a group of artists. At that stage I did not envisage a collaborative project such as resulted, rather that there be some dialogue and planning around the relationship between works and to the site. The Scottish Sculpture Workshop had had a long relationship with John Fyfe Ltd, working with them on a number of international granite symposia during the 80s and early 90s. Place of Origin was a revitalising approach to working with artists, material, place and industry. Maine invited Brad Goldberg, an artist with a significant public art practice in the US, and Glen Onwin, then Principal Lecturer in Painting at Edinburgh College of Art and a noted conceptual artist, to collaborate with him. Maine had met Goldberg at a sculpture symposium in Japan, but had never met Onwin, though they had both had work in From Art to Archaeology, a group exhibition at the Southbank Centre, London, in 1991. John Fyfe Ltd operated the quarries at Kemnay as well as a number of other major quarries, including Correnie and Tom’s Forest, in the North East of Scotland. Granite from the North East of Scotland not only gives Aberdeen its nickname, the Silver City, but it was also exported and used for the Thames Embankment, the piers of Tower Bridge and Electric Avenue in Brixton, all in London, amongst other locations across the UK. More recently granite from Kemnay has been used for the new Scottish Parliament building in Edinburgh . Workers from the quarries of the North East of Scotland also emigrated to other parts of the world and contributed to the development of the industry, particularly in the USA. The village of Kemnay grew up as a result of the quarry. The village is fast becoming a dormitory for Aberdeen, and the connection with the industrial history is less visible. Kemnay Quarry is a substantial hole in the top of Paradise Hill adjacent to the village, but is largely invisible from the settlement. I need to tell you about the process. 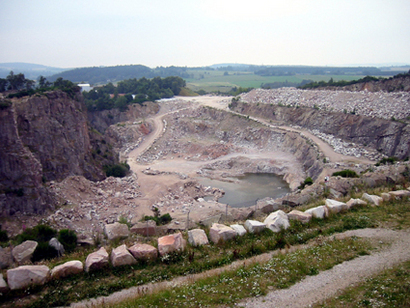 Maine, Goldberg and Onwin first met together in 1996 and developed an initial approach to the context of Kemnay Quarry. Their focus was from the outset to draw attention to the historic quarry workings. They set out a master plan for a number of key focal points around the rim of the Quarry. Working with John Harrison of Harrison Eastwood Engineers, Maine, Goldberg and Onwin proposed the construction of a viewpoint over the quarry, using methods and processes common to the quarrying industry. 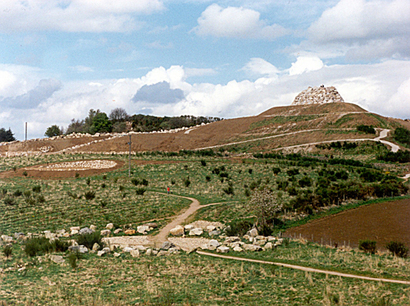 Fortuitously (or perhaps thanks to Jonathan Young, then Deputy Director of Planning at Aberdeenshire Council) RB Farquhar, the property developers, allowed an area of community woodland between one of their developments on the edge of Kemnay and the Quarry, to be designed as part of Place of Origin. The artists worked closely with the Greenbelt Group, who were contracted by RB Farquhar to deliver the woodland and other green spaces in the development. This area of developing woodland, shaped by the artists, provides public access to the viewpoint on the rim of the Quarry. Over the 10 years of the project Maine, Goldberg and Onwin met approximately annually to design and supervise construction of the viewpoint and the landscape, with Maine visiting and directing work on the ground during the intervening months between group sessions. The artists and Maine in particular worked closely with the quarrymen – Robbie Finnie and Mike Kinghorn – and the managers – Alistair Bremner, Sandy Argo and others. The commitment of these individuals was central to the success of the project. The local community, including Mavis Wainman and more recently Chris Honeyball have taken on supporting the project as it has moved from being part of the quarry to being part of the settlement. Maine, Goldberg and Onwin drew on a wide range of knowledge and expertise. I particularly remember the contributions of local and national archaeologists (Ian Shepherd – regional archaeologist and Richard Bradley of Reading University), as well as Duncan Downie, the local historian. The viewpoint, constructed out of some 100,000 tonnes of quarry waste and other subsoil material, takes its cue from a number of key visual characteristics of the locality. These include most obviously Bennachie, a range of distinctive hills, surmounted by an iron age hill fort, that forms a major landmark in Aberdeenshire. The work also draws inspiration from the Quarry itself, and in particular the construction of retaining walls and platforms. More generally Maine, Goldberg and Onwin looked at the North East and Highland landscape including neolithic recumbent stone circles typical of the North East, the Brochs on the Western Isles, and other man-made marks on the landscape characterised by the use of stone. I’ll return to these sources. I want to tell you what this project reveals about collaboration. The nature of the collaboration between Maine, Goldberg and Onwin is, I believe, almost unique. Place of Origin is the result of all three artists, not a work by Maine next to a work by Goldberg and a work by Onwin. This is most obviously manifest in the extensive archive of drawings and photographs where you find the same aspect drawn in three hands, the same issue explored by three different pairs of eyes. Design emerges from shared visual investigation and visual dialogue. Some of this visual material was used to keep the project moving forward. Following occasions when all three artists worked together Maine would draw together a visual diary using key drawings and photographs. These A3 landscape books were made with colour copies and there were only ever 5-10 copies of each. They contain a short text authored by Maine, but the emphasis is on images. They were distributed to key individuals as ‘gifts’ and acted as updates on progress. As a brief aside I have noticed recently that the artists’ photography of the project is very important. My attention has been drawn to this because of the poor photography in both the Aberdeenshire Design Awards and on the Public Art Scotland web site. The fact that they failed to capture this work effectively highlighted for me the importance of the artists’ attention to making a good record of the work and the process. Just about every meeting was focused by the resulting books of images, and whatever publication eventually emerges needs to have this as its backbone. Although these books certainly performed a role in keeping the artists’ thinking coherent over extended gaps, I believe this collaboration developed, at least in part, because of the approach Maine took to bringing the team together. From arriving in Aberdeen and meeting together for the first time, it took five days to get to the site. As the crow flies it is perhaps 15 miles, but the journey was taken as a huge spiral from Aberdeen across the North East of Scotland, into the Highlands to Ullapool, With what was to become a regular feature of the 10 years, we took a diversion around Assynt, an area known to Onwin, before crossing to Lewis to visit Callanish. From Callanish we went on to explore other parts of Lewis and Harris. Back on the mainland the three artists went on down the Great Glen, and only arrived in Kemnay after a process of, yes, getting to know each other, but also building up a shared visual experience. This included ancient sites and modern forms of land management, as well strange experiences – standing on the edge of an absolutely still sea loch, looking across at a faerie island (in fact the peninsula on the other side), with the sun and its dog in front of us, reflected in the water creating four sources of light, and our multiple shadows behind us. I want to tell you what this project reveals about making sculpture. Maine talks about Place of Origin as ‘like a studio project’. The height of the final platform was established in 1997 by using a cherry picker and a tape measure. Engineering drawings were developed from this initial empirical observations. The question was ‘How high up and how far away from the edge will give us a safe vantage point?’. Maine describes working with the process of construction in the same terms of shaping material in the studio, directing huge earth moving machines to adjust the form of the viewpoint as an artist shapes clay. Each massive stone that forms the upper structure of the viewpoint was selected and placed individually, drawing on the expertise of the quarry men and the judgement of the artist. In describing the project Maine talks about ‘making the landscape as art, rather than placing art in the landscape’. In this description it becomes apparent that this project is not ‘land art’ particularly as articulated by Robert Morris whose methodology based on precise information to be constructed by others. Of course the substantial work supervised by the engineer John Harrison and supported by companies doing compaction testing and so forth is ‘plan based’, but Maine’s description of shaping the hill being like working clay in the studio indicates where he sees heart of the process. In the recent film (Tom Maine 2006-07) there is a fascinating discussion between the artists about making the paths across the community woodland, which reinforces this point. The Greenbelt Company had employed a landscape architect to set out the site. Graciously they allowed the artists to set aside that design and implement their own. Although many drawings were done, as well as contour models of the site, in the end the artists went out with the JCB and cut the path network intuitively based on their walking the site in front of the JCB, and their understanding of the contours and desire lines. Some weeks later Maine flew into or out of Dyce Airport over the site and was able to take a photo through the window of the plane. The artists were startled by the image they had created with these paths. In the discussion they describe how the results of their own intuitive work on the ground amazed them when seen from the air. 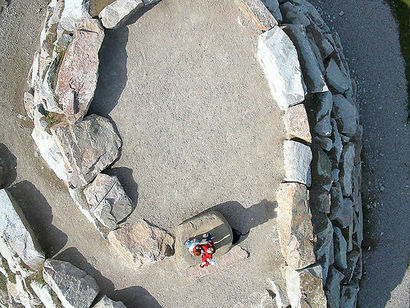 Within the paths they had formed two circles and connecting lines which clearly resemble the sort of symbols used by Picts to represent mirrors. As they comment to each other, they would never have planned or drawn a path network with such an image: it would have seemed too obvious and literal, but to find it emerging out of their walking the landscape clearly thrills and amazes them. Coincidentally it appears that the aerial photograph currently available on multimap must have been taken about this time, and it clearly shows the paths and the furrows for planting trees, as well as heavy machinery constructing the viewpoint. I want to outline how we can understand this work in relation to other large scale landscape works. There are a number of works that I would reference to contextualise Place of Origin. Firstly and inevitably we might look at the work of Robert Smithson. Smithson’s works were a subject of discussion between the artists, a reference point for all of them. Although Spiral Jetty (1970) is the most well known work, the Amarillo Ramp (1973) would also be a useful reference point. It is interesting that Spiral Jetty apparently used 6,550 tons of rock, took 6 days, was part financed by the Virginia Dwan Gallery in New York with $9000. From this we can infer that on one level it too is a sketch or a studio work. In Scotland we have Patricia Leighton’s Sawtooth Ramps (1993) on the M8 motorway. This major earthwork has a far more formal aesthetic and does appear to be something put onto the landscape, in keeping with its environment of industrial parks and motorways. Charles Jencks’ Landform Ueda (2001) at the Scottish National Gallery of Modern Art in Edinburgh is different again. The work draws on Jencks’ interest in cosmology and complexity. It is pre-figured by the garden at Portrack in Dumfriesshire which Jencks created with his late wife, Maggie Keswick. Interestingly, Jencks’ work, although apparently landscape, is most frequently considered in the context of architecture. And in terms of construction is has more in common with architecture, the form being created from cast concrete structures overlaid with earth and sod. Both Leighton’s and Jencks’ works came into existence as what one might call ‘products’ being commissioned by institutions (Sawtooth Ramps was commissioned by Motorola, and Landform Ueda by the National Galleries of Scotland). The latter forms part of the collection of the National Galleries, and the former part of the M8 Project initiated and managed by Art in Partnership. Richard Cole’s Windy Nook outside Newcastle-Gateshead has more in common with Place of Origin that these others. Windy Nook was constructed in the 1980s and completed in 1986. Windy Nook involved the transformation of a colliery slag heap. There are a number of common features including the use of local materials and the creation of a new point from which to experience a locality. All of these works might be referred to in a discussion of site specific work, and all clearly change places and modify our understanding of their contexts. None except Windy Nook emerge so specifically from their context. Place of Origin could only be where it is, tied to its location by sight lines to Bennachie, by the form of the landscape and the form of the land ownership, built substantially out of material from the immediate vicinity by processes used in that specific industrial context. John Latham‘s APG placement in the Scottish Office, though fundamentally different, does shed some light. His proposal to designate bings as monuments, an action which involved no aspect of shaping the landscape, operates at the level of ‘drawing attention to’, a phrase Maine also uses. In this way Place of Origin, though a sculptural exercise, is more significantly an exercise in drawing attention to the context, the surrounding landscape, the human intervention in that landscape. For all the effort, for all the massiveness of the sculptural project, as an experience it directs our attention to the quarry and to Bennachie, to the line of the river and to the settlement. Bear in mind that there are photographs from the early part of the 20th century that show bings of quarry waste material at Kemnay in the same location on the quarry rim. Our physical experience of these different works is also informative. I’ve never seen anyone on ‘Sawtooth Ramps’, nor have many people actually visited ‘Sprial Jetty’ (although those that do do walk on it). Landform Ueda is ‘walked on’ at SNGMA, and some of the bings are heavily used. Place of Origin is a walk, taken by people with their dogs, and kids on bikes, as is Windy Nook. They are physically experienced, perhaps more than viewed or seen as an aesthetic object. There are also another set of reference points. Maine, Goldberg and Onwin suggest that Place of Origin shares an aesthetic with a Japanese garden – it reflects the larger landscape it sits in. In the film made recently, I think it is Goldberg who talks about this Japanese concept translated as ‘borrowed landscape’. This concept is used in Japanese garden design to bring the larger landscape into the garden. .
As I mentioned above, the form of the viewpoint borrows from Bennachie, the dominant hill on the horizon. But there are a number of additional borrowings and references. The artists set out the tree planting to mirror the larger landscape. So at the bottom of the site we find willow, and in the middle birch and oak, and in the upper areas pine and larch. The rise across the whole site is perhaps 30m, but as you walk, once the trees reach maturity, you will have the experience of passing through a much greater range of environments, foreshortened. Finally and perhaps most subtly, I have a very strong visual impression of the raked curving patterns in the gravel in Japanese gardens. Working with the man ploughing the ground in preparation for the tree planting, Maine guided him in curves that follow the contours of the landscape. Normally this ploughing is simply done in straight lines. So embedded within the structure of the site is a very careful patterning to accentuate the landscape’s own shape. Place of Origin took 10 years and is a project which I am very proud to have initiated. Its not often that anyone has the opportunity work with such interesting people over such an extended period on a project of such ambition. You will have noticed that I have offered several different perspectives, from the practical to the art historical. At the time my role was clear – I was Director of the Scottish Sculpture Workshop, we were doing this project, and we did what was necessary. Since then I have had to think about my role, and I would now, retrospectively, describe it as ‘producer’. One point of reference for this term is the recent publication ‘The Producers’ (Jerwood, 2008). One characteristic highlighted by the interviews in that book is the close working relationship between the artist(s) and the ‘producer’. So, with John, I was negotiating with many partners, securing funding (and writing the attendant reports), setting up events for the community to find out more about the project. I learnt more about the area I lived in travelling Aberdeenshire with John going to meetings and taking frequent diversions exploring the landscape. There were points, particularly when a mobile phone mast was being sited on the rim of the quarry, where I thought I was going to be left with half a work of art. In the end the relationship between ‘I’ and ‘we’ is loaded. ‘I’ seems egotistical, but ‘we’ conflates everyone into a unity: different roles, skills and personalities are obliterated. So if I can suggest that this project was like going for a walk. I ‘initiated’ it only in so far as I suggested to some people (an artist and some quarrymen) that we might go for a walk. We were only able to go for a walk because they also wanted to go for a walk. In practice we were led further and to more interesting places by the artist. Many people joined the walk for periods. Not many did the whole of it. Ideally some of those other voices would also tell this story, since I am sure they also have several things to tell. I am sure there is also more I can tell you. I’ll probably add bits later. Maine is known for working in stone, and has been commissioned to make formal public works outside the Southbank Centre in London, for both Standard Life House and the Royal Bank of Scotland in Edinburgh. But he is also known for his landscape works such as on Portland with Common Ground and more recently in the sea defence works on the Isle of Wight. Goldberg has been lead artist for a significant number of public projects across the US including parks, mass transit systems, and museums. Onwin is known for his conceptual works using natural materials and processes. He explores the physical properties of essential materials including salt. His work appears in galleries and on sites. His work, As Above, So Below, was commissioned as part of the programme at the Henry Moore Studios in Halifax. Place of Origin was possible because of the vision and commitment of a number of key individuals: the vision of the artists, the support of people working at Kemnay Quarry in particular, as well as members of the community in Kemnay. Sadly John Harrison, the engineer, who became a member of the team, and shares responsibility for the project with the artists, died in 2006. Alistair Bremner, Estates Manager for, first, John Fyfe Ltd, and then, following a merger, for Aggregate Industries, supported the project throughout its evolution. Robbie Finnie and Mike Kinghorn built most of the viewpoint. The Greenbelt Group allowed the artists to redesign the landscape they were responsible for, and worked closely on the implementation of the design. Place of Origin was supported financially and in-kind by John Fyfe / Aggregate Industries as well as the Scottish Arts Council National Lottery; the Scottish Executive’s Aggregate Levy scheme, the Esmée Fairbairn Foundation; The Hope Scott Trust, and other trusts and foundations; RB Farquhar Homes; and Aberdeenshire Council. This article has been published on the PAR+RS web site. Peter Robinson has explored the geology, botany and landscape of Place of Origin on his web site.